The Eureka Spitfire 1 Tent is a low-cost, lightweight, and durable double wall camping and backpacking tent that weighs 2 lbs 12 oz. Easy-to-setup, this classic hoop-style shelter has plenty of interior room to sit up inside, change your clothes, or store essential gear. Complete with durable aluminum poles, the Spitfire provides plenty of wind and rain protection with an abundance of interior mesh for good ventilation. If price is a priority, but you want to get a quality product that is going to work well and last for years, the Spitfire 1 is a top pick. 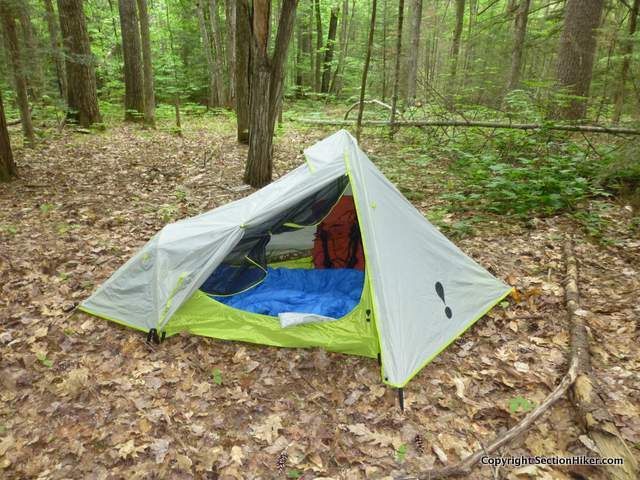 That’s why I’ve included it in my list of the 10 Best One-Person Backpacking Tents. The Eureka Spitfire 3-season, 1-person tent is an easy choice for lightweight backpacking trips that won’t zap the bank account. It has a more room than most solo tents, while the hoop-style poles make setup easy. Inner Tent Dimensions: 100″ long, 42″ wide at chest, narrowing to 24″ wide at foot. Due to the diamond shape, tent is best used by people who are 72″ tall or less. Minimum number of stakes to pitch: 4, although I’d recommend using 6-8 for maximum tautness. The Spitfire 1 has a diamond-shaped inner tent that has a deep bathtub tub floor suitable for camping on wet ground. The inner tent is suspended from two hoop-style aluminum poles which fit into side grommets, and staked at the head and foot end. When purchasing inexpensive tents, it’s always important to get a tent with aluminum poles and not fiberglass ones, which break very easily. The Aluminum DAC poles provided with the Spitfire are much more durable. 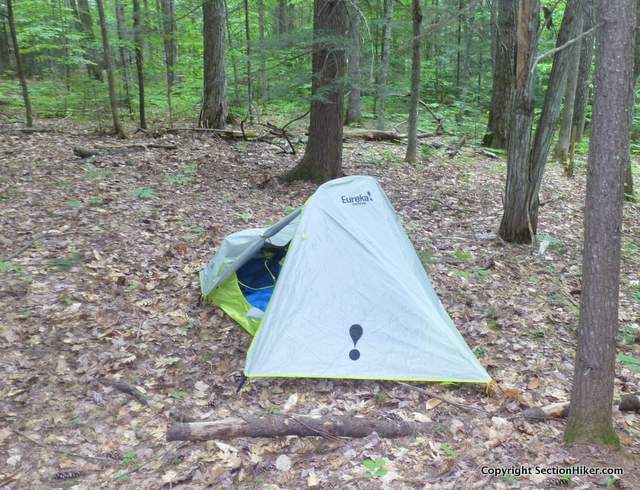 While the inner tent is 100″ in length, the pointed ends are two narrow to lay in. The effective floor dimensions are closer to 72″ long x 39″ high x (42″ wide at the chest, tapering to 24″ wide) at the feet. 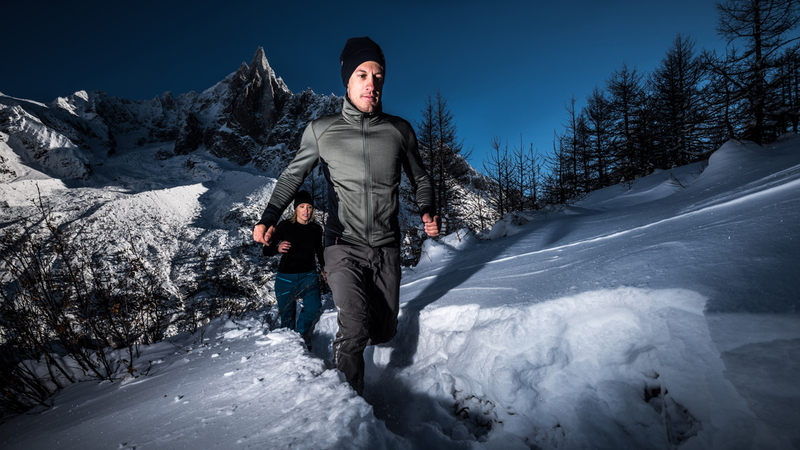 In other words, the tent is best used for people who are 6′ tall or less, while the pointed ends are still quite good for gear storage. 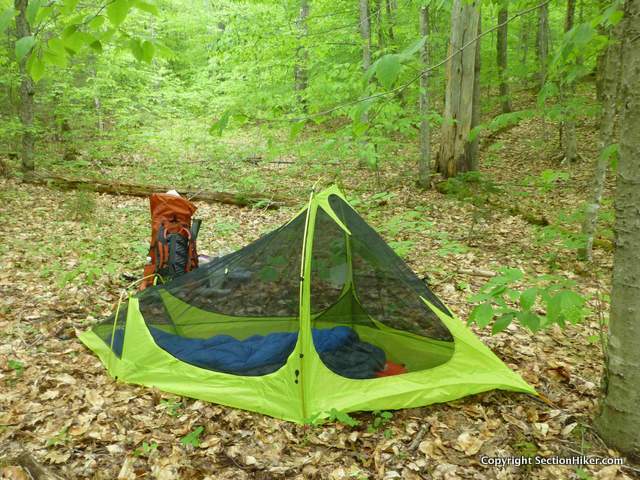 The inner tent is so well ventilated and spacious that it’s almost worth buying the Spitfire 1 just to use it alone. In addition to the abundant side-wall mesh, there are mesh panels situated near the feet to help keep the foot end of your sleeping bag or quilt dry, or dry out wet shoes if you stash them here at night. The amount of ventilation is quite nice, particularly when you can roll back the rain fly and let the wind blow through the side walls unfettered. There are side mesh pockets along the inner support walls to hold valuables. The inner tent also has a zipper in the roof, so you can reach open or close a roof vent in the rain fly without having to get out of the inner tent to do so. The inner tent has one zippered side door, with a long J-shaped zipper that provides easy entry and exit. The mesh side door can also be rolled up and secured if insect protection is not an issue. The Spitfire rain fly drapes over the inner tents aluminum hoops and secures to its corners using durable plastic buckles. The head end is color-coded, so you can orient the fly in the right direction without having to think too much. Two stakes are needed to secure the vestibule door and the opposite side of the tent to the ground while velcro loops on the underside of the fly can be used to secure the fly to the hoop poles. There are also additional guy out points on the fly to stake down the tent in very windy weather, but you’ll need to supply your own reflective cord to guy them out. The Spitfire 1 has one vestibule on the door side, which is quite narrow and difficult to store gear in because it blocks the side door. If your pack is fairly empty, you can scoot it into the narrow space behind the door as shown. You can also compensate for this lack of vestibule storage by unloading keeping gear in the triangular head and foot end of inner tent, or even alongside you in the tent because it’s so wide. While there is a second covered space on the opposite side from the door, it’s not reachable from inside the inner tent. Adding a zipper there or a “closet-style” pass through, like those found on some Sierra Designs tents, would make that space a lot more functional. The roof vent provides much needed ventilation when you have to batten down the hatches in bad weather. 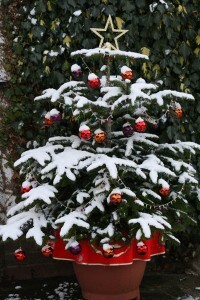 One place where the rain fly does shine is the top vent, which can be propped open or closed from inside the inner tent. It is ideal for venting the warm air that accumulates inside the tent (since it rises) and is the leading cause of internal condensation. 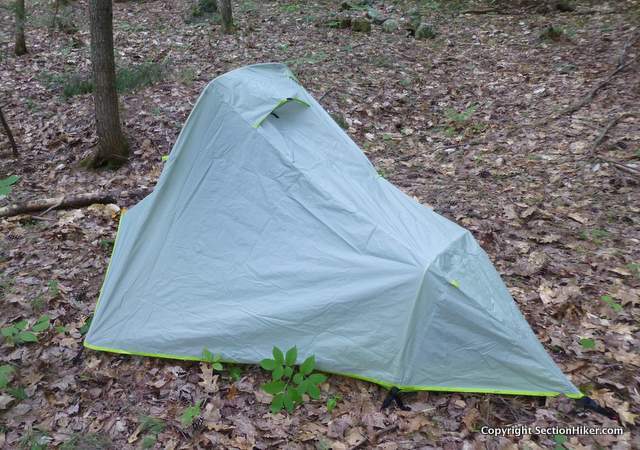 Honestly, it’s difficult to get a super taut pitch with the Spitfire 1 rain fly because the fabric doesn’t have much stretch, like the lighter weight fabrics you’ll find on more expensive tents. The buckle tensioners and webbing can’t be pulled tight enough and the overall shape of the tent requires a uniformly flat pitching surface that you’ll be more likely to find in a campground than at a wild, off-trail trail site. If you’re willing to ignore these pitch aesthetics, the rain fly will still protect you in heavy rain and wind, even if it’s not the prettiest looking rain fly you’ve ever seen. The aluminum poles are plenty strong to maintain the structure of the tent, provided you stake it out completely before a storm. If cost is a priority, it is hard to beat the value of the Spitfire 1. There are plenty of thru-hikers who’ve hiked the Appalachian Trail with the Spitfire 1 and it’s not going to hold you back either. 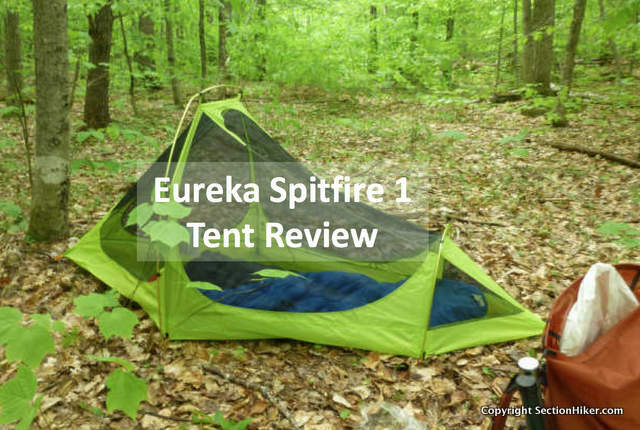 The Eureka Spitfire 1 is a surprisingly good value for a one person backpacking tent. It weighs just 2 lbs 12 oz and has durable aluminum poles, a spacious interior with excellent ventilation, and it’s easy to set up. While it’s quite long on paper, it’s best used by someone who’s 6 feet or less in height because the diamond-shaped interior isn’t completely usable as sleeping space. If that’s not a limitation, but cost is, you’ll have hard time buying a tent that’s as good at the Spitfire at a comparable price. It really is a great value, perfect for the occasional backpacker or scout.